Prep Day: Make the béarnaise sauce – In a small saucepan, combine the tarragon, shallots, vinegar, and wine over medium-high heat. Bring to a simmer and cook until reducedby half. Remove from heat and set aside to cool. Place mix in a blender, add egg yolks, and mix. With blender running, add one-third of the butter in a slow, steady stream. Once it emulsifies, turn the blender speed to high and add remaining butter. Season with salt and pepper. Cool and store in fridge till ready to use the next day. Catfish – Heavily coat catfish in Cajun spice. Place in hot skillet with half of the oil. Sear in pan, add butter, and blacken. Turn heat to medium low and cook for three to four minutes per side until cooked through. Hash – In a separate nonstick pan, sauté potatoes and ham until potatoes are golden. Divide potato ham hash between plates. Eggs – Wipe pan with paper towel and add egg; cook until it’s sunny-side up. 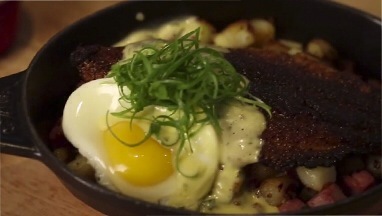 Place catfish on hash, top with fried egg and drizzle béarnaise sauce, and serve.